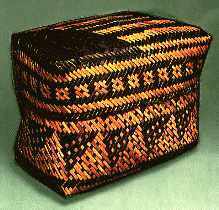 Oklahoma (Western Band) Cherokee double-woven walnut-dyed buckrush basket 8.5 x 14", Ella Mae Blackbear, 1981. After the forced removal death marches, survivors in Oklahoma couldn't find familiar plants. Buckrush midribs are a substitute. 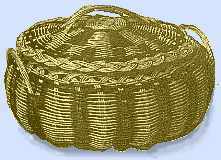 Rivercane double-woven "coffin" basket, 10 x 15.5 x 8". Rowena Bradley, 1985. Swimmer Branch Community, Eastern Cherokee, Qualla Boundary Rez, NC. 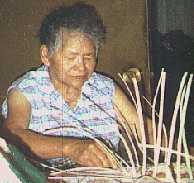 Rivercane is the traditional material. Shape, pattern inspired by early 1700's Cherokee basket in the British Museum. From Eastern Cherokee Band Elementary school (Qualla Boundary NC), Eva Taylor, mother of 5th grader Ira Taylor, tells of being taught basketry by her mother Emma Taylor, -- cutting white oak, making and dyeing splints, weaving. The school's interest inspired me to get going on this basketry section, which I'd collected some links and info and pictures for, over a year ago. Bloodroot is slmost universally the common name for this plant that Mrs. Taylor gathers for dyes in all shades of red, from orangish to dark reddish brown. 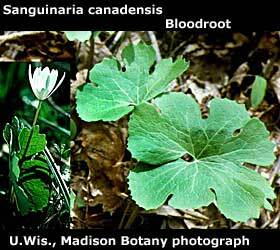 Sanguinaria canadensis is its botannic species name. 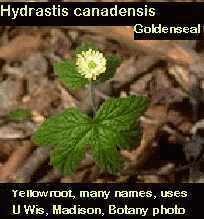 It grows in shady woodland glades from northern Canada to quite far south. Yellowroot is just one name for this plant that Eva Taylor describes gathering with her mother. This plant has been dug to near-extinction due to its root's popularity as a non-Indian "medicine". Selling for about $100/lb in health food stores now. Nowadays, those plants are all farmed, not wild. Beds must simulat shaded woods environment, and the plant takes 8 years to mature. History of Tslagi people. Establishment of Qualla Boundary reservation. Link in this paragraph to a page of Cherokee links, starting with the school. Map shows location of the Qualla Boundary reservation, in Western North Carolina, in the foothills of the Smoky Mountains. Burden baskets of this general shape -- sometimes supportd by a tumpline around the forehead -- were common all over North America. This Eastern Cherokee woman was photographed on the reservation in 1908 with a large one woven of rivercane. Wide mouth makes it easy for the wearer to toss over either shoulder plants gathered in foraging, or harvested. The funnel shape distributes weight for easy balance. Rivercane, a bamboo-like hollow reed, grows in bottomlands of southern rivers. Dozens of utility baskets per family were in pre-contact times normal tools of family living: for storage, carrying, preparing and serving food. CREDITS: Rowena Bradley basket, color photo by Bobby Hanson for Ralph T. Coe Lost and Found Traditions : Native American Art 1965-1985 travelling show catalog, out of print. Ella Mae Blackbear basket, black and white photo from Coe catalog, colorized by me from memory of the show. Family photo of Qualla Cherokee basketmaker Emma Taylor reduced from larger one on Cherokee Elementary School web page. 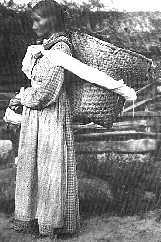 Woman with burden basket -- Smithsonian Institution, M.R. Harrison photo collection. Bloodroot photo from Dr. Virginia Kline's photo lectures, on the University of Wisconsin (Madison) 5,000-botany images archive. Goldenseal, photographed by Mimi Kamp, from medical plants images gateway maintained by Michael Moore, head of the Southwestern School of Botannical Medicine. Webmistress -- Paula Giese Explanatory text and graphics copyright 1995.